For anyone serious about websites, having good statistics about visitors, pages viewed, path and engagement is a must. There are many options out there offering free or paid website statistics, but I will focus here on two top solutions, with enterprise features and most importantly, free for use. I have tested both web analytics I am going to present below, and each offers a great suite of features. What makes them different is the stats privacy as one is hosted on a third-party server, and the other is hosted on your own server with access only by you. 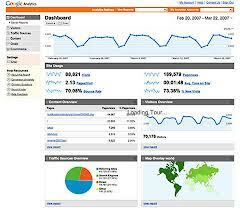 Google Analytics is a free enterprise web analytics solution for your website. You can set many websites to gather stats in Google Analytics, set different profiles, gain insights that matter. You can measures sales and conversions, set targets, get insights about how visitors interact with your websites, how did they get to you, keywords used in search engines, referrer websites and on what pages are they exiting. Google Analytics is a tool built with customization in mind, with easy reporting that can be changed to show the data you are interested in most. Some new additions like social analytics show you the success of your social media campaigns, while visitor paths point the path of visitors on your website (what pages they landed on, pages visited within your website, page exit – a great way to see user interaction with your website and see what pages / sections you can improve in order to improve visitor flow). With such tools you can improve flow from product page to complete order page, something that can have amazing benefits over your sales. Google Analytics data is private, but as they are hosted on Google servers, some webmasters might not be so happy about Google privacy policies. In this regards, there is another similar solution: Piwik. 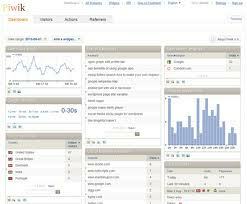 Piwik is a free web analytics solution. It comes a s script that you can install on your own server, this making the data collected by this script as private as possible, accessible only by the hosting server administrators. Being a self-hosted solution, stats data is gathered in your own MySQL database. Installation is straight-forward, once you have copied the Piwik files on your server, follow the simple step-by-step guide and within 5 minutes you will be running your own web analytics solution. Minimum installation requirements for you server are PHP environment and MySQL databases. Piwik offers some similar features with Google Analytics, same easy-to-read dashboards with collected data, fully customizable. Many plugins and modules are available to download and install in Piwik that will simply add more functionality to your web analytics solution. With Piwik you can track visitors to one or multiple websites, with real time data about landing pages, referrers, keywords, time on website or exit pages. The features offered by Piwik cannot compete with Google Analytics, but are more than enough for the majority of webmasters. This entry was posted on Monday, August 27th, 2012 at 10:48 am	and is filed under Analytics, Scripts. You can subscribe to any comments to this entry via RSS 2.0. Comments are currently closed, but you can trackback from your own site.